Sheila had the great idea to act out this book as part of our K-2 Book Adventure “Dogs and Cats” theme. It’s one of my all-time favorite picture books, but not a preschool storytime book really, so I don’t get to use it often. We used three people to tell it, but I think two could work it out. 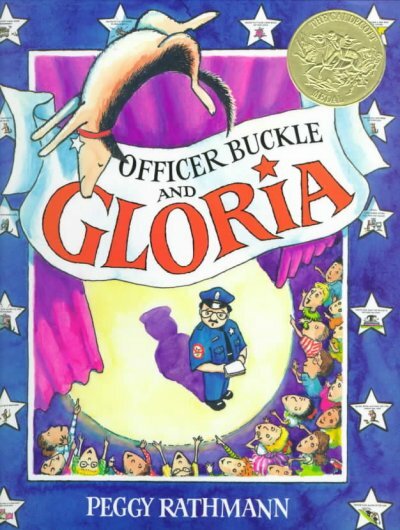 In our version, I narrated, Terri was Officer Buckle, and Sheila was Rosie the Dog. We adapted the text to just the essential bits and projected selected illustrations from the book, mostly towards the beginning and ending. For example, when Terri read off a boring list of safety rules, we showed the illustration from the book with the bored, sleeping kids. When Officer B. gets Rosie, though, the focus is more on the characters, so no slides for a bit. The safety presentations work just like the book. Terri says a rule as Officer B. (“Never leave a thumbtack where you might sit on it!”), then Sheila, sitting behind Terri as Rosie, jumps up as if she just sat on a tack. And the kids in our audience respond just the way the kids in the book, do, laughing at Rosie while realizing that Officer B. doesn’t know what she’s doing. Sheila gives a little “woof” each time she’s sitting again, to signal Terri that she can look behind at Rosie again. We did several of these and each one got funnier. It’s that puppet show effect where puppet A does stuff, puppet B doesn’t see, then as soon as puppet B looks, puppet A stops. The timing is trickier with two real people, but they pulled it off just right. And of course the anticipation builds each time as the kids wonder what Rosie is going to do next. 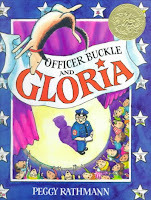 When Officer Buckle and Rosie watch themselves on tv, the Sheila and Terri sit down and look up at our screen, where we projected the illustration from the book where Officer Buckle learns the truth. I liked the way our projection screen actually became Officer B’s television for that bit. We didn’t dramatize the disastrous accident at school (after Gloria and Officer Buckle stop doing shows together)…for that we showed the two page spread from the book on the screen. The conclusion, where dog and safety officer are reunited, worked well: Terri and Sheila get back together on stage, while the last illustration of the book goes up on the screen, along with the last safety rule: “Always stick with your buddy.” I’ll post a of our whole K-2 Book Adventure – “Dogs and Cats” program soon. 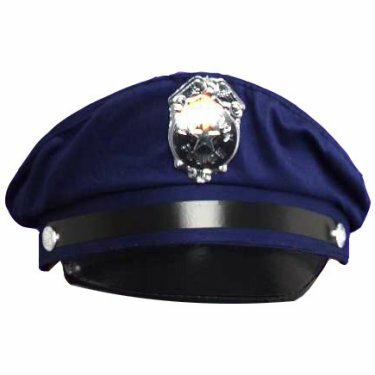 * a note about the dog ears: We had regular dog ears available like the pair shown, but Sheila would not accept these: she insisted on making some more German Shepherd-y ones, which turned out very nice…I just forgot to get a photo.